Championship side Jersey Reds have signed Oli Bryant, Josh Hodson, Tom Pincus and Jason Worrall and confirmed the departure of 18 players. 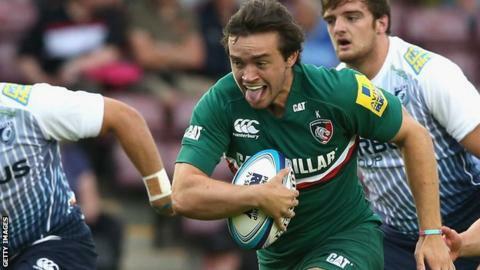 Truro-born fly-half Bryant, 22, joins from Leicester Tigers, where he made two Premiership appearances. Wing Hodson, 20, was playing for London Welsh last season and Australian utility back Pincus, 24, previously played for Queensland County. Former South Africa Under-20 full-back Worrall, 23, completes the signings. Meanwhile, Sami Fisilau, Joe Buckle and Jack Cuthbert are among 18 players leaving the Reds this season. Ross Adair, Joe Buckle, Nick Campbell, Jack Cuthbert, Samisoni Fisilau, James Freeman, Nick Haining, Gary Graham, Sam Katz, Simon Kerrod, Rich Lane, Sean McCarthy, James McKinney, Pierce Phillips, Lewis Robling, Nick Scott, Mark Tampin, George Watkins.